Pain relief and weight loss! Five years ago I had my right foot crushed at work. Along with my crush injury I herniated two discs in my lower back. I purchased my infra-red sauna after a trip to Mexico. I'm from Canada and I find that the cold really makes me achy. While in Mexico I noticed that my back, foot, knee and other sore joints felt much better. 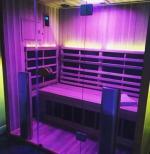 After little thought and research I purchased an infrared sauna for my home. I had no idea how much this purchase would impact my life. Due to my injuries I'm unable to exercise. I have lost 45 pounds over the past year with literally no change in diet and little to no exercise. I sit at a desk all day, and have never been to the Gym. Im 6 foot 2 and used to weigh in at 236 lbs, I now weigh 195! I just turned 30 years old and am a father of 3 young children. My family has reaped great benefits from me being in better physical and mental shape. I used to rely on medications such as OxyContin, perks and morphine to get me through the day. Now, well, when I get achy I get in my sauna for 45 minutes ( do not recommend anyone starts out with this long of sauna treatment). Your Body builds up its tolerance to the heat, when I first got my sauna I could only tolerate 20 mins at a time. Between the weight loss and the pain management benefits I have experienced, I highly recommend sauna treatments to everyone I know.